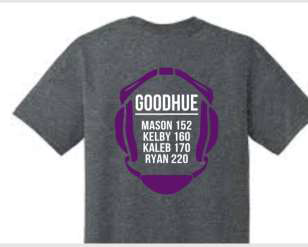 Goodhue 2018 State Wrestling T-Shirts for Sale. FRONT & BACK of shirt – Shown in picture. Thank you for supporting Goodhue Wrestling and these 4 wrestlers as we all wish them the very best at State!!! On the heels of a second consecutive Team Section 1A Runner-up finish the previous week, Goodhue Wrestling had an outstanding Section 1A Individual Tournament Friday and Saturday. Ryan Schoenfelder’s overtime victory in the last true second match of the event allowed him to join teammates Mason, Kaleb, and Kelby with a trip to the Xcel Energy Center this week. 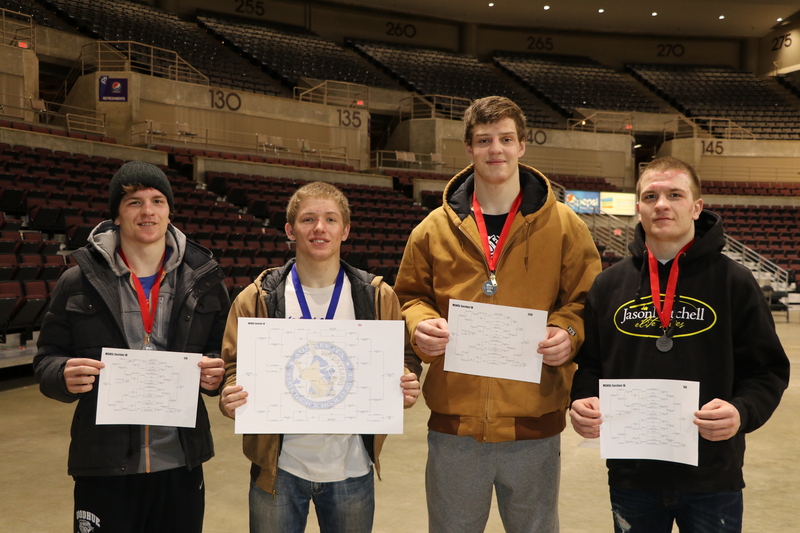 This is the 8th year in history of sending 4 wrestlers to state. Other years were 2017, 2013, 2005-2007, 2002, and 1997. After a Section runner-up finish at 170 pounds last year, Mason Huemann succeeded to win his first Section Championship at 152 pounds. Kaleb O’Reilly bounced back from a close 2-1 loss in the finals with an overtime victory to return to the Xcel. Kaleb returns to state again after going as a freshman in 2016. Kelby O’Reilly knocked off the high seed in the Section semis before dropping his finals match to a talented Caledonia senior. But a strong performance in his true second match gave him his second consecutive trip to state. After going in opposite years, 2018 marks the first year the twins will compete together at the state meet. To say the least, Ryan Schoenfelder had an exciting Saturday. After winning his semi, in the finals Ryan couldn’t hold on to a 3-1 lead in the third period, and ultimately fell in the second overtime ultimate tiebreakers. Forced into a true second match, Ryan again went into overtime, emerging with a 10-9 victory. 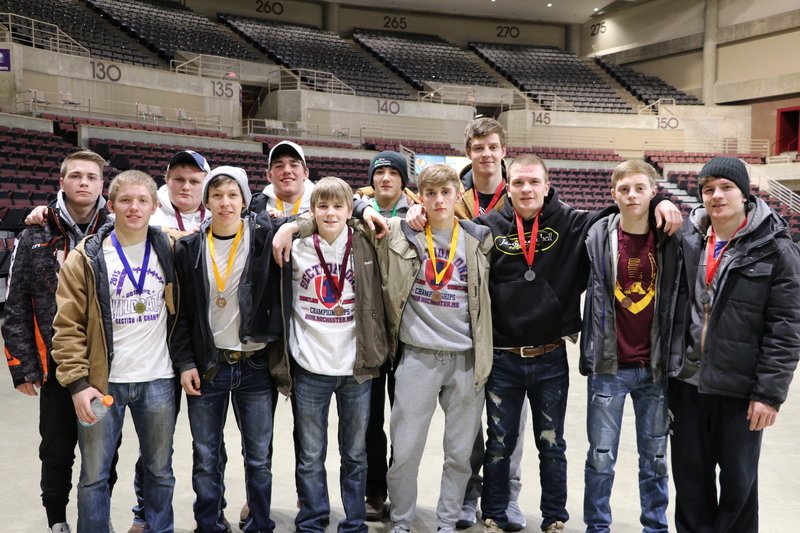 Overall, 13 wrestlers competed and 12 earned All-Section honors, tying Goodhue in Section 1A for most medalists. This sets a recent era record of All-Section medalists, surpassing 11 medalists in 2017, 10 in 2016, 9 in 2015, and 10 in 2013. Due to the predicted incoming snow Saturday evening, the Section 1 Individual Tourney has moved up tournament times by an hour to allow travel home to begin earlier. The day starts tomorrow at 10:00 with semifinals (instead of the original 11:00). Day 1 went well overall. Goodhue entered 13 of the 14 weights, and 12 earned All-Section honors and will compete tomorrow to determine just exactly which place is theirs in Section 1A. Maddox, Bjorn, Mariano, Baxter, Mason, Kelby, Kaleb, Kodee, and Ryan are the 9 championship semifinalists competing at 10:00 a.m. tomorrow. Ryley, Travis, and Jacob are waiting in the consolation semifinals. Brackets as well as a live dashboard of the action, if you can’t make down, can be found by going to http://www.trackwrestling.com and clicking on “events” at the top, then “search events” and type in “mshsl” and the “MSHSL Section 1A Tournament” should be the first thing at the top. We hope you can make it to cheer on the guys at the Mayo Civic Center! Goodhue Wrestling takes the mat at 11:00 a.m. in a Team Section 1A semifinal. Chatfield will lineup on the other side of Mat 1, and Caledonia and ZM compete in the top-side semi. If you can’t make it to the Mayo Civic Center, follow along on the dashboard of Track Wrestling (click on “Events” -> “Search Events” -> type in MSHSL in search bar to find the tourney. Or follow match results posted to Twitter and Facebook. The semifinal winners will square off at 1:00 p.m. with a Section title on the line. Tonight the opening rounds of the Section 1A Team tournament begin. The top 4 seeds host the other teams. #7 seed Dover-Eyota and #10 FCLMC square off in Goodhue’s gym at 6:00 p.m., and the winner advances to the quarter-final to meet Goodhue at approximately 7:00 p.m.
Quarter-final winners advance to compete at the Mayo Civic Center at 11:00 a.m. Saturday morning. Two winners will meet in the finals at 1:00 p.m. for a Section 1A championship and a trip to State Tournament two weeks later. We hope to see you tonight for the final home dual of the 17-18 season!